A flaming red hot ticket from the country music scene belongs to none other than the fiery and fierce country songstress Miranda Lambert. If you are starting to feel the heat on this side of town, that’s because the ‘Keeper of The Flame Tour’ is soon coming your way. 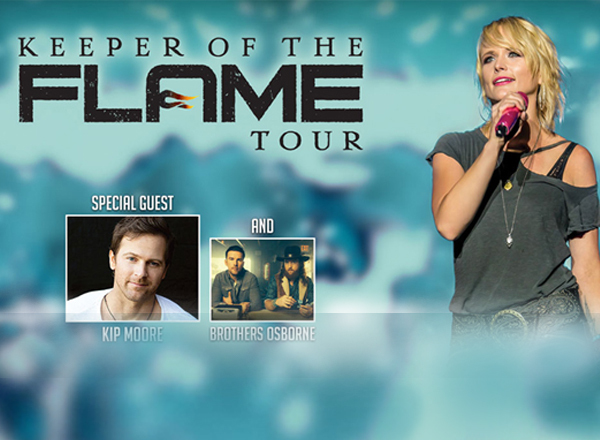 Miranda Lambert fans are definitely catching fire and are frantically getting their hands on those hot tickets. Avoid the mad rush —that is, if you still can…No time to waste, get those tickets in a flash! When Miranda Lambert joined and bagged the third place in the reality TV contest ‘Nashville Star’ in 2003, it was clear as day that a new country superstar was on the rise. Since then, Lambert has become one of the brightest artists that light up the country music galaxy. In 2005, her debut album ‘Kerosene’ fired up Billboard’s Hot Country Songs charts through its lead singles "Bring Me Down", "Kerosene", and "New Strings”. From one platinum album to the next, Lambert also bagged most of the major music awards, which include the most prestigious tGrammy Awards, the Academy of Country Music Awards, and the Country Music Association Awards. In fact, she has won the Female Vocalist of the Year award from the Academy of Country Music for six years in a row. Hence, she holds the record of having the most consecutive wins in the category. With her raging energy and impassioned delivery of songs, her live shows turn into a one big sing-along party where fans join her as she dishes out her best-loved country anthems like "Famous in a Small Town," "Gunpowder and Lead," "White Liar," "More Like Her," "Kerosene," "Only Prettier," "Mama's Broken Heart," "Automatic," "Something Bad," and "Little Red Wagon."